Whether you're thinking about sprucing up your front entrance, an elegant driveway, a simple patio to just sit and soak in the sun, or a complete backyard oasis with colourful gardens, ponds and the soothing sound of a waterfall, Dreamestate Landscaping can make those dreams come true. We care about our customers, craftsmanship, and environment, providing you with only the highest standards and quality, all of the time. We can design and build an ideal outdoor living space so that you can spend time enjoying your home, both inside and out. - Dreamestate Landscaping is a proud, active member of both the provincial and federal professional landscaping associations Landscape Ontario and Canadian Nursery Landscape Association). - Our Principal serves as Vice President on Landscape Ontario's Waterloo Chapter Board of Directors as well as a director on the Contractors Sector Group, and served for over 6 years as a director on the Provincial Board of Directors. 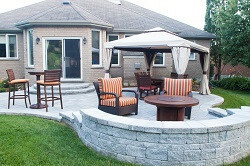 - All projects are managed by our Landscape Industry Certified Manager. - Our lead installers have been trained and certified by the Interlocking Concrete Pavement Institute. - Dreamestate Landscaping was the first authorized Techo-Bloc Contractor in South Western Ontario, one of only three Certified Aquascape Contractors and the only Certified RainXchange Professional in the region. All of which requires extensive experience and proven quality to achieve. - Dreamestate Landscaping is one of only five 'Trusted Installers' of the unique Paverdeck™ System.